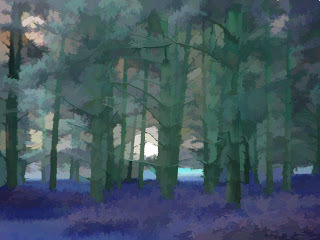 Another manipulated digital image, this time of Thetford Forest which is quite near us. My huband has found stoneage arrow heads near here. Mountain village near Malalga, Spain. I am very much inspired by images and places around me. Since coming to grips with my digital camera and manipulating my images, I am constantly inspired! I have been printing these images onto cloth and collaging them with paper and stitching with thread. These have been well received at exhibitions and purchased by the viewers. I surprised myself with my photography, but I was reminded that my father was a skilled amatuer photographer and so it must be in the blood. Sadly he died young at 52. 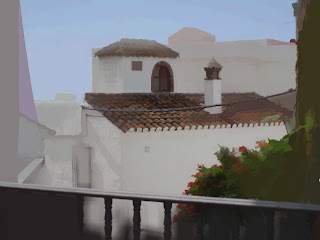 My husband often paints from the images I take too which is exciting. We have another exhibtion lined up at Cavern 4 in June 2007. more details later. 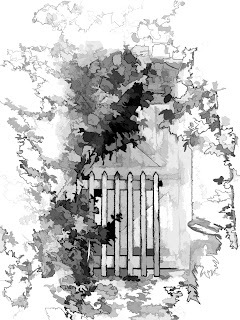 The picture is of our garden gate! This is a detail of one of my latest quilts, which is a quilt I never really liked, painted, then cut up and rearranged and stitched back together. It is one of my series of Out of the Dustbin quilts, so called because I had literally thrown two quilts in the dustbin. An ex-student of mine phoned just after my disposal, and during the course of the conversation asked what I was doing. On hearing what I had done, she told me to get the quilts out of the dustbin. I decided to recycle them by applying paint and so the new work was born! There will be an article about these quilts in the next issue of Quilting Arts. Dan's paintings are on the walls, some of my beachcombing boxes on the cupbaords and some of Louise's toys in the glass cabinets. Dan, my husband trained as a painter and Louise our daughter trained at the London University of the Arts. Hi, I love all things textile and I hope you enjoy my work. I'm a designer maker, teacher and author. My latest book is on CD and was published in August entitled Glitzy Quilts. My website is www.annettemorgan.co.uk where you can see some of my work and my lists of workshops and talks. I have just had an exhibition with my husband at Art Van Go, in Knebworth, Hertfordshire, UK, which went very well. It is the first time we have exhibited together in 30 yeras of marriage! When we met I was a nurse and Dan was an art teacher, I wasn't very well versed in art and I can remember we visited the tate Gallery in Londona and there wasn't anything I liked! Things ar edifferent now and we have the same tastes. Our kids are both arty, Joel works in a bookshop and wants to be a writer, Louise, married to Jono, trained at the London College of Fashion and is a toy maker, and recently made 3 quilts which she says is addictive.